With extracts of red vine leaves and horse chestnut, alkaline minerals and stomach friendly vitamin C.
Dietary supplement containing extracts of red vine leaves and horse chestnut, alkaline minerals and stomach friendly vitamin C.
Consume 2x 1 capsule with sufficient liquid to a meal. 150mg vitamin C (stomach gently, *188%), 300mg potassium (*15%), 100mg horse chestnut seed extract is equivalent to 600mg substance horse chestnut seeds, 200mg red vine extract contains 10mg total polyphenols, 40mg quercetin, 40mg rutin, 20mg aescin. *RDA (recommended daily allowance) = recommended daily intake amount. 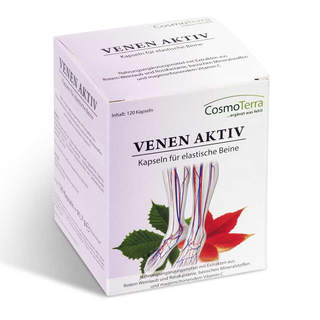 The values of the active ingredients are based on average analysis. Potassium bicarbonate, red vine extract, capsule shell hydroxypropyl methyl cellulose, sodium ascorbate, horse chestnut seed extract, cross calderon, rutin, parting agent magnesium salts of edible fatty acids, colouring titanium dioxide.